There is a new platform for immersive learning games that’s taking classrooms across the world by storm. Based on the same principles as interactive Escape The Room digital games — which challenge players to use their surroundings to escape a prison-like scenario — Breakout EDU is a collaborative learning experience that enhances critical thinking and creativity while fostering a growth mindset in students. Click the image to access the Lunch and Learn App Smash SMORE. Click the images below to access the presentation resources. Anyone can CONSUME content. Be a PRODUCER and CREATE it! Don’t tell anyone, but I’m NOT happy the school year is almost over. I want to keep teaching, coaching and learning. I have new tech tools to try, and more classrooms to visit. Especially my new role as an instructional coach and teacher leader. After 27 years, I still feel so fortunate to be in the education profession. I don’t HAVE to go to work, I GET to go to school. Click the image to view examples of student projects created with Google Apps for Education. 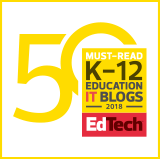 Blogging in the classroom gives students a true purpose for writing and offers them numerous opportunities to connect authentically with others. This ENHANCES learning! Students are actively creating content rather than passively consuming it. They are engaging with their peers on a daily basis as they read and comment on each others’ posts. Click on the image below to access blogging resources and view student examples. 20 years ago, my colleague Jim Svendsen and I presented a Literature Circles session to a standing room only crowd at ASCD’s annual conference in Baltimore. We were blown away by the enthusiastic response. Educators from all over the nation contacted us, and we spent the next few summers providing professional development to school districts up and down the east coast. We had learned all we knew about Literature Circles from Harvey Daniels, the author of the seminal classic, Literature Circles: Voice and Choice in the Student-Centered Classroom. After reading it, we never approached student reading groups the same way again. I’ve been doing Literature Circles in my classroom for the last 20 years, and I wanted to share my latest incarnation of this amazing student-directed learning activity. With the advent of new instructional technology tools like Chromebooks and Google Apps for Education, my students’ literature circle experience has continued to evolve. This year, students in my class were able to meet virtually and engage in book club discussions using applications like Twitter, Google Hangouts, TodaysMeet and Padlet. Although the preferred choice is always a 3D discussion, students who were absent could connect with their Literature Circle groups using their smartphones at home with these powerful tools. Additionally, book clubs continued meeting on weekends and during winter/spring breaks. The enthusiasm for participation in these student-centered discussions sky-rocketed as technology provided a bridge to 24/7 learning. The wonders of Google Slides allowed group members to collaborate on Literature Circle presentations where key components of the experience were shared with classmates and peers inside and outside our school walls. Students were creating content as evidence of learning and sharing this content with an authentic audience. Next year, I will use some of their presentations to introduce Literature Circle/Books Clubs to my new groups of students. Click the link below to view examples of these amazing collaborative presentations.